A couple of months ago, I wrote about the abundance of oranges in Downey. (See If you're an orange.) So what can you do with all these oranges? 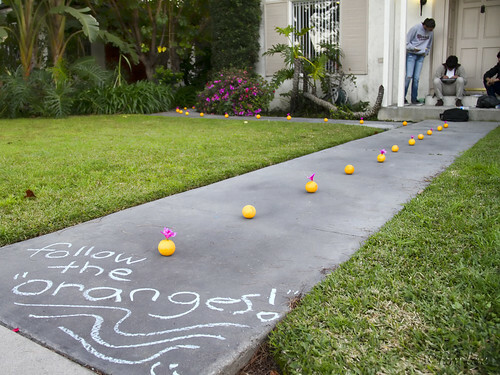 These teens decided to create a treasure hunt while they waited for their friend to get home. It started with "follow the oranges." Then, if I remember right, it went to a clue at the side of the house, back to the porch, then to the mailbox, to the fireplace, to the basketball court in back, to a closed umbrella that, when opened, dropped flower petals and a note saying, "You're awesome!". I love this. It makes me want to buy way too many oranges.